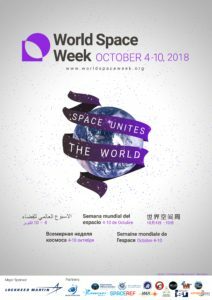 World Space Week 2018 broke records with an estimated 5,000 events in over 90 countries October 4-10. The theme was “Space Unites the World.” Below were some highlights of this amazing celebration of space, the largest in world history. Video wishing “Happy World Space Week” in different languages from around the world. Cruise liner Cunard will conduct its second annual Transatlantic Space Week aboard its flagship, Queen Mary 2, as it voyages from New York to Southampton from October 7-16. Space Selfies will be taken by Planet satellites during World Space Week. Following the global call for ideas, six activities have been selected, ranging from a 70x50m space rocket using recycled materials in Mexico to a 80 x 50m symbol in Abu Dhabi. A World Space Week rally with 1,000 students and dignitaries will be held in Nashik, India. It will be inaugurated by the Minister of State for Defence, Dr Subhash Bhamre. Leicester’s National Space Centre, United Kingdom, is hosting a World Space Week Family Sleepover, giving families the opportunity to spend the night sleeping under giant rockets, next to spacesuits and even beneath the stars. IMAX will be releasing a series of mini space documentaries and short interviews with astronauts during every day of World Space Week 2018. These will be released on their official social media channels. Space for Humanity and Yuri’s Night will organize the ‘World Space Week Celebration: Space Unites The World‘ event on October 5 in Hawthorne, CA. Iranian Space Agency, together with over 60 state-run and private organizations will be cooperating to hold programs in Iran during World Space Week, including competitions and workshops for students and teachers. Institute of Space Technology (IST) in collaboration with the national space agency of Pakistan Space and Upper Atmosphere Research Commission (SUPARCO) will celebrate `World Space Week 2018′ in Pakistan with a number of activities and competitions. ‘Echo in Space’, a visual and sound performance will be held in Thailand on October 9. Syrian Astronomical Association will be organizing various events in Syria such as observation nights, scientific lectures at schools, universities and cultural centers. Scientix is organizing various activities in support of the World Space Week – you can have your articles featured on the Scientix blog, participate in an interactive Scientix webinar and have your questions about space science answered by an expert from the European Space Agency. Postcards printed for World Space Week will be sent between space enthusiasts in Europe and China, as a gesture of goodwill. Over 50 events are being planned in Israel such as ‘Yoga in Space’, ‘Escape Room – Yuri’s office’, and Augmented Reality and Virtual Reality stations. Numerous activities will be held in Lebanon such as story telling nights, workshops, star gazing, lectures, film screenings etc. Around 1,000 participants are expected to attend World Space Week celebrations in Ethiopia. Over 28,000 students attended World Space Week exhibition in India. Listen to a World Space Week song in Japanese, and download a space music album by Test Shot Starfish for free until Oct. 11. Around 1100 participants attended a World Space Week lecture on “Recent Achievements in Space Technology” by Dr. Pradeep Kurlukar at the Inter-University Centre for Astronomy & Astrophysics in India. How will you celebrate World Space Week? Add your October 4-10 event to the global calendar and promote World Space Week in social media!